Priefert Angus, Belvidere, Neb., purchased top end Kasselder Angus genetics. Troy Douglas, Harrisburg, Missouri, was a volume buyer at the Kasselder Dispersal sale. 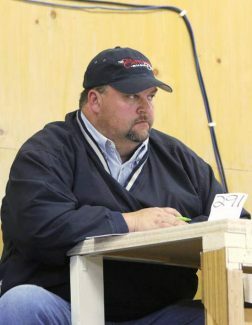 Ken Kasselder at the Kasselder Angus Cow herd dispersal and bull sale. Cooper Tonniges, Ord, Neb., purchased several females to add to his herd at the Kasselder Angus bull sale. Location: Burwell Livestock, Burwell, Neb. 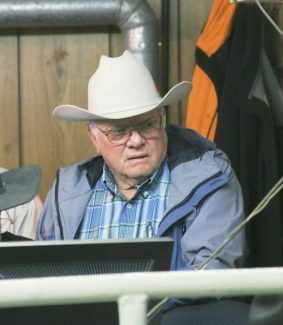 The decision to disperse a cowherd is never easy and not a decision Ken & Ann Kasselder took lightly. After many years of breeding and developing an outstanding cowherd Ken and Ann decided it was time to let the cows go. With that being said, a dispersal sale is a great opportunity for buyers to add the best of the best of the Kasselder Angus cows into their programs. Ken Kasselder took great pride in developing this herd of cows and the results were very evident on sale day. The cows were in great shape with healthy shiny calves at side. The cows had eye appeal, great dispositions and excellent udders. The pedigrees were loaded with the top cow builder sires in the Angus breed. In order to not put additional stress on the few cows that had not calved yet by sale day, those were left home and sold via video. Topping the pairs was lot 86, KFS EXAR Upshot 4033-401, a Mar. 2014 daughter of EXAR Upshot 05628 and out of a Mytty in Focus dam. This cow has epds of CED 9 BW 1.3 WW 53 YW 97 Milk 26 and sold with her Mar. 17 KFS Efficient 2105 bull calf at side for $6,750 to Casey Redman, Burwell, Neb. Also at $6,750 was lot 140, KFS 840 Mentor 7374-389, a Mar. 2013 daughter of Connealy Mentor 7374 and out of a Bon View New Design 878 bred cow. Epds of CED 2 BW 2.3 WW 49 YW 86 Milk 28, she sold with Mar. 1 Musgrave Big Sky bull calf at side to Priefert Angus, Belvidere, Nebraska. Casey Redman picked up two more pairs at $6,500 and $6,260 each. Lot 113, KFS Bextor 9323 4801-434 is a mar. 2014 daughter of KFS Bextor 9323 with a Feb. 23 Connealy Capitalist heifer calf at side and lot 104 KFS Capitalist 028 4243-423 is a Feb. 2014 daughter of Connealy Capitalist 028 with a Mar. 17 heifer calf sired by KFS Efficient 2105 calf at side. Topping the open heifer calves was lot 56, KFS Capitalist 535, a Feb. 2015 daughter of Connealy Capitalist 028 with epds of CED 11 BW -.9 WW 58 YW 101 Milk 20 selling to Anthony Zeman, Bassett, NE for $6,500. The top selling bred cow was lot 138, KFS 726 Mentor 7374- 382, a Mar. 2013 daughter of Connealy Mentor with epds of CED 0 BW 2.9 WW 47 YW 88 Milk 25 that sold bred to Onward 321S-1225 due mid April. 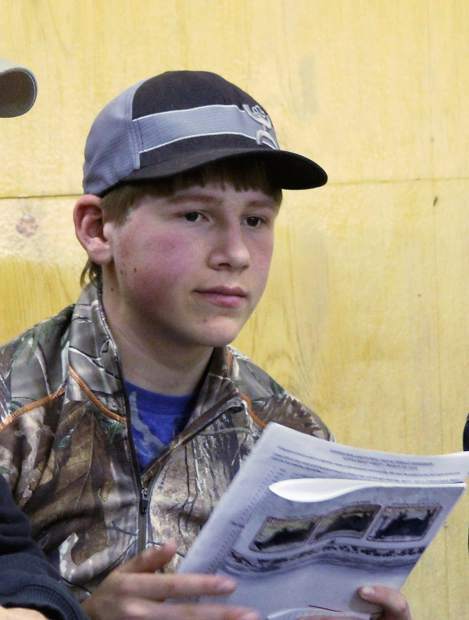 Kevin and Jake Kasselder, Ericson, Nebraska, were the buyers at $6,000. On the bull sale side of things, the high seller was lot 39, KFS Poss Impact 5729, a Mar. 2015 son of Poss Lasting Impact 3118 that has epds of CED 2 BW 3.3 WW 66 YW 113 Milk 16. The bull had a 205-day wt. of 882 pounds, weaning ratio 121, yearling wt. of 1,453 pounds, ratio 114. 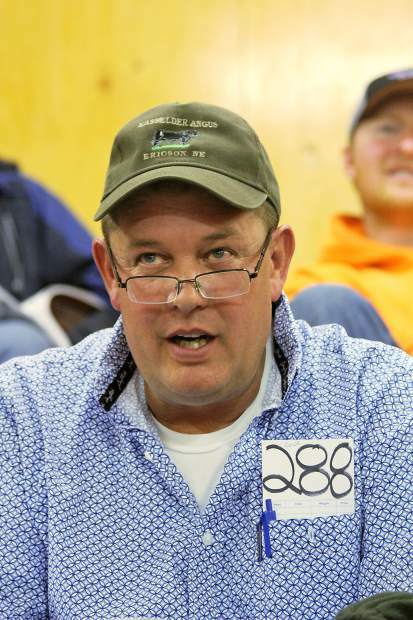 Curtis Gurney, Burwell, Nebraska, was the buyer at $7,250. Flannery Inc., Atkinson, Nebraska, picked lot 40, KSF Poss Impact 5916 a Mar. 2015 son of Poss Lasting Impact 3118 for $6,250. This bull has epds of CED 8 BW 1.0 WW 58 YW 106 Milk 18 with a weaning ratio of 106 and yearling ratio of 105. Lot 34, KSF 1407-142–5833, an Apr. 2015 son of KSF New Design 1407-142 with epds of CED 6 BW .2 WW 50 YW 92 Milk 20, 205 day wt. of 783 pounds and yearling wt. of 1327 pounds Double G Angus, Johnstown, Nebraska, was the buyer at $6,000. This was a great dispersal sale for the Kasselders and I am sure these cows will make great additions to the herds of their new owners.